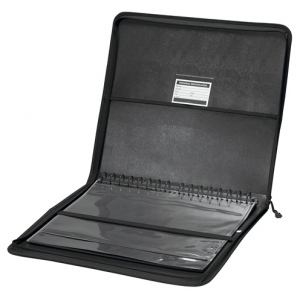 Black heavy-duty polypropylene presentation case has attractive stitched cloth edges with smooth zipper closure. * Collapsible handle on spine allows pages to hang downward. * Inside: one side equipped with a large pocket while the opposing side has a retaining strap to hold panels in position during transit. * Includes ID/business card holder and 10 acid-free archival protective sleeves. The page count is 10 pages, 10 protective sleeves.